As our family huddles together, watching the season's very first snowstorm from the comforts of our living room, I thought I'd take a break from holiday celebrations and do another peripheral post. I discussed my non-photography-related workflow when I switched from Evernote to El Capitan's Notes app. But while I brushed the subject, I never mentioned how important iOS had become in my computing life over the past twelve months. Btw, if you're at all invested in iOS as a work platform, you owe it to yourself to read Federico Viticci's now traditional end of year app review on Macstories. I've made a point of making this a yearly rendez-vous and it always provides fresh new ideas and never fails to teach me about apps I've missed along the way. Until recently, iOS apps had usually always been satellites for me: they'd circle around their Mac counterparts, synchronizing content in the background, offering what was essentially an added bonus—a way to access stored information in a pinch. You know, for those times when the real computer wasn't available. This year however—thanks to iOS 9 and the evolution of the platform through multitasking and the continued refinement of extensions—I realized that in many cases, the Mac had simply morphed into an unnecessary middle-man. That it had become a satellite for certain tasks. I'm nowhere near as invested as Federico in terms of workflow—my work isn't at all the same. But Steve Job's truck analogy has, true to form, become incredibly prescient: even with a brand new iMac 5K in the studio, my desktop is now, more than ever, a machine dedicated to heavy lifting, one cog amongst many; a single piece in a much larger mechanism. The days of the Mac as Digital Hub are most definitely over. It started with Evernote. Before the recent Notes update, the app was instrumental to a few projects—These Kings These Subterraneans being one of them. But I hated the Mac version and spent most of my time in the iOS app, only using the desktop when absolutely necessary. This slowly began transforming my perception of iOS from an ancillary component to a much more fundamental part of my ecosystem. But writing is where the migration eventually began in earnest. This has become an increasingly important portion of my work over the past two years and now, with collaborations to Photo Life magazine and a new publishing format for KAGE Collective, even more so. The epiphany happened last summer while I was in the U.S for a shoot: I was sitting at the desk in my room, taking notes on my iPad with the small Logitech keyboard I'd purchased a couple of weeks prior to the trip. Music was streaming through the tiny speakers, just enough to set a mood on a quiet Sunday morning. I realized just how comfortable this setup was: for some reason there's something much more immersive and conducive to concentration about writing on an iPad. And although this has long been associated to the device's single app mindset, the new multitasking features haven't broken the spell, adding convenience without the complexity of a full windowing system. When I came back I pretty much stopped sitting at my Mac when it came time to write. And because of this choice, iOS slowly took on a much more central role in my workflow. I've always loved the idea of a task manager...without ever actually managing to stick to a single one for any decent amount of time. It's the kind of thing that gives me hope, lifting my spirits like a New Year's resolution—until my own, deep-rooted indiscipline inevitably gets the better of the situation and out goes the GTD app, along with dreams of a better me. I'd tried 2Do earlier last year and it had met with the same fate. In fact I couldn't really wrap my head around it. But last November—with new projects on the horizon and a serious need to organize— I decided to give it another go: and this time a light turned on. 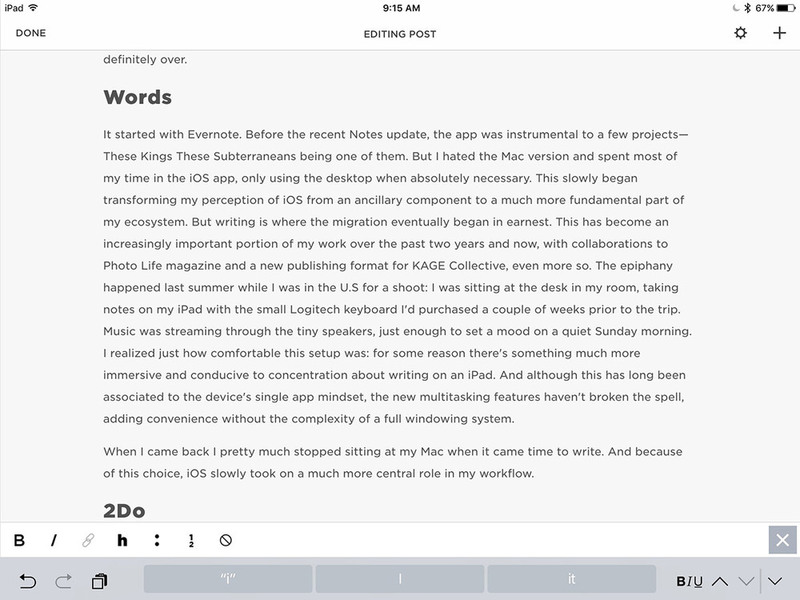 Then a few days in, Macstories (Viticci again) published a review of that very same app that gave me even more insight into the application's capabilities, confirming my choice. I suggest you read it if you're interested: it's a great review for a very impressive and deep piece of software. But here's what's interesting about it (and relevant to this conversation): the company offers a Mac version and I was, out of sheer force of habit, getting ready to purchase...when it occurred to me that I didn't need it. I didn't. Why add a desktop counterpart to something I'd likely seldom use outside of iOS? No reason at all. When I'm working on the Mac my iPad is right there beside me; when I leave the house I have my iPhone; when I'm travelling I have both the iPad and iPhone. The Mac fills another niche entirely. With Apple Music, listening habits have now also shifted away from the desktop and iTunes/hard drives where our personal library has always lived. In our home we'll often find ourselves streaming from an iOS device and iCloud instead of accessing these local drives (unlimited internet helps, obviously). In many instances this is actually faster than messing around with Home Sharing. I run presentations and speaking engagements from Keynote on the iPhone (video and audio) with the iPad as controller and notes presenter. Everything hooks up via hdmi or a combination of VGA + Bluetooth or analog. I'll be abroad on assignment in January, using Adobe's mobile apps on my iPad Air 2 to deliver images—a first for me. All of these changes are obviously bound to mobility and an increasing need to be productive anywhere, anytime. But I believe that's only part of the story: design also plays a role here. In many situations using these apps is no longer a compromise: I prefer the iOS workflow. The form factor of these new devices combined with touch, with an operating system and apps tightly built around a simple interaction model...all of it has changed our expectations, modified how we anticipate to interact with software. And given how much we use our phones and tablets, it's hard to prevent these new patterns from taking over our reflexes and becoming the new normality. There's no way I'll be leaving the Mac behind anytime soon...and yet as we begin 2016 it's clear that, in my world at least, OS X is now an editing and creation platform. It's the heavy lifter for my photography, for designing books, for larger projects and—until Squarespace offers a more robust mobile editor (that includes all backend features and controls)—for web publishing and management. But facts are facts: in a majority of cases it's now iOS that's become the day to day, operational OS. Impressive how the tables have turned.